MANUFACTURER/IMP BY: COLTS P.T.F.A. MFG CO. MODEL: 1903 POCKET HAMMERLESS ACTION TYPE: Semi Auto Pistol CALIBER/GA: .32 ACP Serial #: 242014 BBL/OAL: 4" BBL. 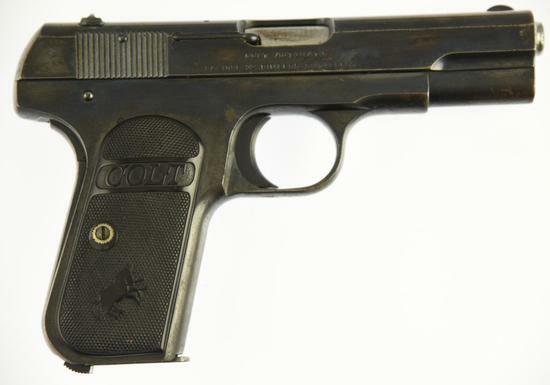 DESCRIPTION: .32 ACP cal., Type III w/ 4 in. +/- barrel, charcoal blue, checkered hard rubber grips, hammerless, slide lock and grip safeties, NO barrel bushing. Mfg. 1903-1946. DOM 1917 per Colt Website. Type 3's mfg 1910-26. SN# 105,051-468,096.